Home CULTURE Sticky Mike’s closure: what’s going on with Brighton’s music venues? In October, Sticky Mike’s Frog Bar announced it will be closing its doors at the end of the year. Fans of the much-loved music venue responded to the announcement with an outpouring of love, expressing dismay at the news. “It’s a blow to the local community,” says Alex Murray of Brighton promotion company One Inch Badge. “It had established itself as an important hub of the local scene.” The thing is, Sticky Mike’s is not the only small venue Brighton has lost in the past few years. Is this a trend which will continue to threaten Brighton’s music scene? What might the future hold? In the early half of this decade, much-loved venue the Blind Tiger Club was lost. Its site had been a licensed music venue for over 160 years but was forced to close in 2014 after noise complaints – despite 11,000 people signing a petition for it to stay open. Before that, in 2010, noise complaints also caused the Freebutt to shut its doors. The venue was required to limit its volume to such a low level that it was no longer realistic for it to host live music. Sally Oakenfold, the manager of Sticky Mike’s Frog Bar, says her venue has received noise complaints throughout the years. However, while this has been the cause for other venue closures, there’s something else forcing her hand. “Costs have gone up and up,” Oakenfold tells us. Rising rent, rates and insurance have led to the business closing. She adds the building is not being maintained by the landlord, which has caused issues with damp, flooding and damage to the building which would be expensive to repair. The rising competition between venues is another issue. Brighton’s music scene is hugely saturated, which is great for concert-goers who want a selection of gigs to choose from every night. But could it also be leading to smaller venues closing as they struggle under the pressure? “It’s not easy to survive in competitive markets,” says Oakenfold, who also manages The Hope & Ruin. This is an idea that is echoed by Anna Moulson, who runs Brighton-based promotions company Melting Vinyl. She explains that when she founded the company over twenty years ago, there were hardly any venues, nor were there many other promoters. Now that there is much more competition, things are certainly seeming more difficult for the industry. So how has the loss of Brighton music venues affected the musicians that would be playing in them? 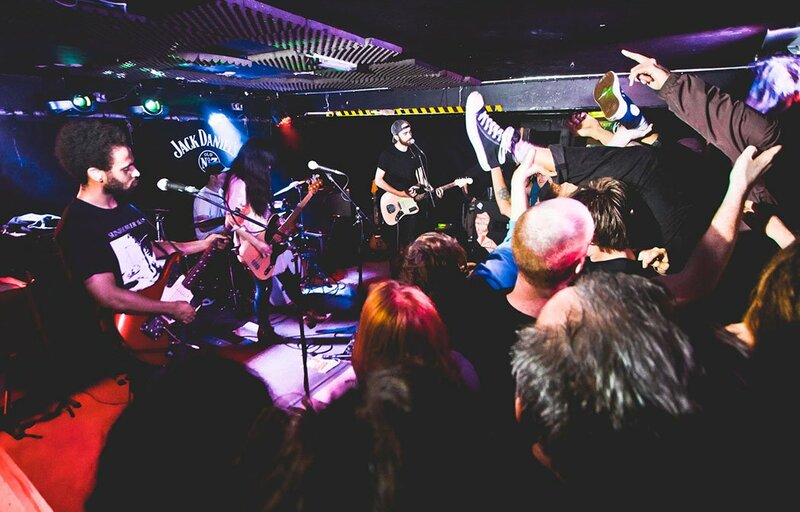 Brighton band Beach Riot say they think Sticky Mike’s closure will certainly affect up-and-coming bands. “There are not many other venues in Brighton of the same size. Being able to pull big enough crowds to fill larger venues like The Haunt is a big jump for new acts.” The band also think change needs to come from the government if small venues are to survive. Oakenfold shares this view. “Many venues in Europe get funding and are seen as cultural assets to their town or city,” she says. “GMVs are an important part of the ecosystem for new ideas and without some major changes it’ll have an effect on creativity down the line.” She explains there are too many venues closing down throughout the UK, and that this will no doubt have an impact on the future of live music in this country. Moulson also notes the contrasts between the situation in the UK scene and in Europe, saying the continent has laws which prevent noise complaints from being grounds for closing venues. She believes unless such laws are implemented here, increased housing development in Brighton may cause problems. Despite this, Moulson adds that she’s positive about the future of the local music scene. “Brighton is quite exciting right now in the fact that one of the major industries is the music industry,” she tells us. She says she thinks Brighton and Hove City Council has realised just how much the music industry is worth for Brighton. Hopefully this means investment in imminent? There does seem to be evidence to support this positive theory. Earlier this year, we saw the government move to support the ‘Agent of Change’ principle. This proposed law would mean that if a residence is built near a music venue, the builder is responsible for soundproofing. This could be a significant step forward in preventing GMVs from getting shut down from noise complaints. The principle has already been adopted by the London Plan, and it is hoped that it will soon extend to councils across the UK. Despite recognising Agent of Chance is a step in the right direction, Oakenfold tells us The Hope & Ruin is not going to become complacent. Noise complaints are clearly not the only problem facing small venues, and their owners are recognising there’s still risk with running this kind of establishment. But, as Moulson says, there is still great demand for live music in Brighton. So, perhaps there is hope we are not facing the death of Brighton’s music scene. Only time will tell.